They are all so wonderful, and this is not at all self congratulatory, it's fun to see what happens after the purchase is made. I have yet to cover my books with your fabric + will send along a photo when it's done. You might have to do a second post for the slackers out there. Again, your fabric is too wonderful + great to work with. Thanks for offering it! That must be so exciting to see! Well done - your fabrics are so lovely. oh it all looks so wonderful! and you've introduced us to some lovely new crafters, which is always a good thing. thanks! how fab do they all look??? and all in your great fabric - well done you are very clever! Aaaack! There's that pillow I've been OBSESSED with! I knew that fabric looked familiar. No wonder I love it!! Your work is just beautiful. And how fulfilling it must be to see what others have created with it :). all great, but the tweet tweet pillow takes the cake! i havent stiched up mine yet, but I CANNOT WAIT! 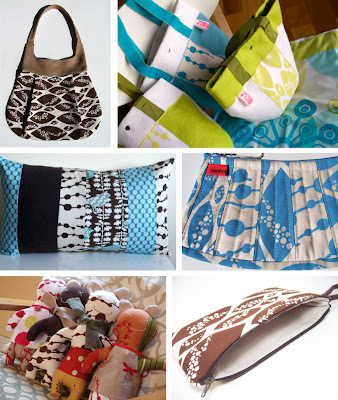 I love all the bags, such great fabrics, so many possibilities!